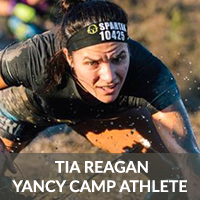 Premier OCR Athlete Tia Reagan - Yancy Camp - Fitness for Everyone! Tia Reagan is from Oklahoma City, Oklahoma. She is a stay-at-home mom who devotes her free time to OCR training. She is married to her husband, Reid and they have two kids, a son, Cru, 8 and a daughter, Ricki, 3. Tia’s passion growing up was playing basketball. In middle school she discovered her talent and love for running. After an accomplished High School career, Tia moved to Austin, Texas where she joined Rogue Athletic Club, an Olympic development team. As a member of Rogue she focused on the 5k and 10k distances while achieving a 5k PR of 15:47 and a 10k PR of 33:15. After a successful professional running career, Tia began training with Yancy in 2018 and is now fully devoted to OCR and is enjoying the challenge of a new athletic pursuit!